Deadline: This project’s deadline is Monday, April 15, 2019, at 11:59pm (that is, just before midnight) wherever you are. It was posted in the morning, California time, on Thursday, April 11, 2019. The Assignment: Record a piece of music for an audience of one. 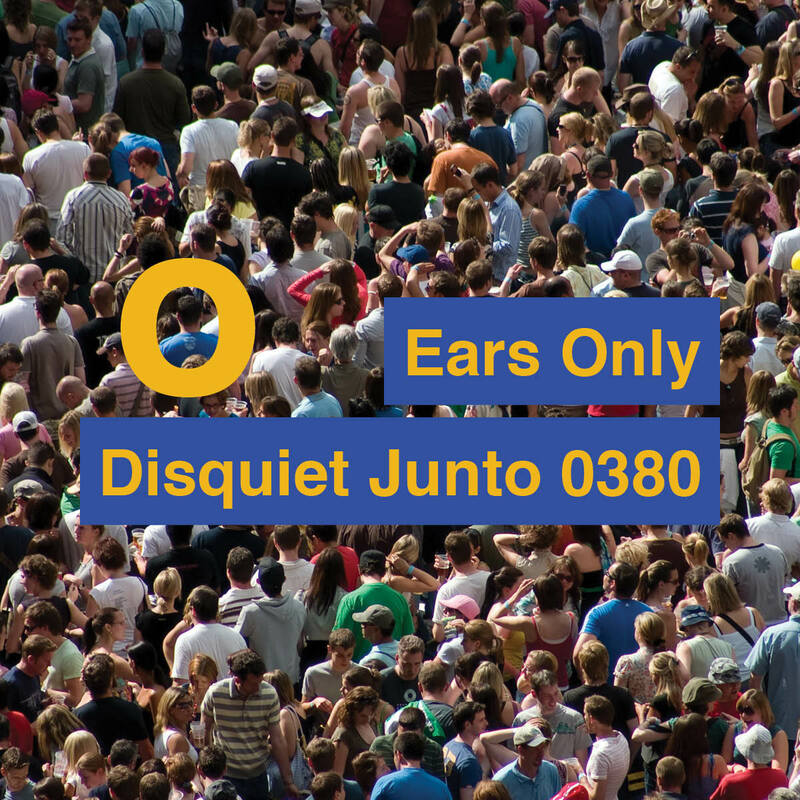 Step 1: Include “disquiet0380” (no spaces or quotation marks) in the name of your track. Step 2: If your audio-hosting platform allows for tags, be sure to also include the project tag “disquiet0380” (no spaces or quotation marks). If you’re posting on SoundCloud in particular, this is essential to subsequent location of tracks for the creation a project playlist. Step 6: If posting on social media, please consider using the hashtag #disquietjunto so fellow participants are more likely to locate your communication. Step 7: Then listen to and comment on tracks uploaded by your fellow Disquiet Junto participants. Length: The length is up to you. Title/Tag: When posting your track, please include “disquiet0380” in the title of the track, and where applicable (on SoundCloud, for example) as a tag. Download: Consider setting your track as downloadable and allowing for attributed remixing (i.e., a Creative Commons license permitting non-commercial sharing with attribution, allowing for derivatives). As a coincidence, the Junto called for a piece of music that I was making anyway. It’s a remix of a video of Jacob Collier explaining how his arrangement of “In The Bleak Midwinter” modulates through various keys to end up in G half-sharp major. That’s the key midway between G and A-flat. It’s the geekiest thing I’ve ever heard. I find the joy of Collier’s explanation to be much more effecting than the arrangement itself. In general, while I like Collier’s energy and enthusiasm for harmony, I find his actual music to be exhausting. It’s too much information. So I guess this track is my way of requesting that Collier make music the way I like it: more repetitive, more groove-oriented, more hip-hop flavored. Random pitches and rhythm generated on the modular. Sounds are Karplus-Strong simulations of a string both hammered and plucked. For a friend born with 100% hearing loss in one ear who wanted me to explain stereo. This is an alternate take of Ruin. in the past, when we were friends? I made this tonight using two samples – one by Morricone and the other a lo-fi loop that I chopped up using mpc software. It moves methodically, ABC, through different sample areas in its Morricone ‘melody.’ This is for an earlier version of me. This piece was written for someone close to me who experience a terrible loss when very young. It’s meant to evoke my acknowledgement of their pain and my hope for their recovery. I meet on a monthly basis with a small group of photographers to share the work we have done recently. I have found that surrounding myself with smarter and more talented people is the best way to develop my skills and steal ideas. About a year ago I decided to ask the other members of the group for an image of theirs to which I would write an accompanying piece of music. To date I have only asked two, and only started to write music for one of the images. So I took this week’s task to force me off my duff and complete the piece I had started a year ago to accompany Jim Mitchell’s (http://mfotografie.com/) image, Broken. Broken was written for Clarinet, Horn, Violin, Viola, and Cello. P.S. I have placed the image at http://glsmyth.com/temp/Broken.jpg - alas, it is unacceptable for a piece of photographic art to be blindly cropped to a square. I had a very good friend in college who was completely blind. I had a very difficult time explaining to him the concept of vanishing point. I don’t think that I was able to succeed, hopefully you will have better luck. I would love a transcript of that conversation. This week’s disquiet came at the perfect time. I was planning on doing this project anyway, but the prompt to make a piece for one specific person was ideal for the project. This piece is in honor of my late Grandfather, Lee Eugene Bratcher. All the audio from this piece is from a field recording I made of grandpa’s funeral last weekend. (Except for the lone bass synth at the beginning) It’s more of a sound art piece than an actual composed musical work. My grandfather was a veteran and a delightful and friendly man. He will be dearly missed. "Lee Bratcher passed into his eternal home on Friday, March 1, at Samaritan Albany General Hospital. In lieu of flowers or charities, his family requests donating a book to your local library in memory of Lee Bratcher, who loved books." Very thankful for the prompt this week. I’ll report the results when available. This is for my dad. He died last January. He loved “Rocket Love” by Stevie Wonder (open.spotify.com/track/5bYjwooath…0jTByV2-m3GbIwdA), and often sang - a little out of tune - the “doo-doo-doo” theme at the start. This small piece is inspired by that fond memory. I miss him very much. Taking the assignment one step further. Composing and performing. I wrote many compositions dedicated to people, requiems, love songs, and just plain dedications. But this particular little melody caught the attention of a film producer and I’ve got the commission: to record this and other 4 melodies I wrote as a « theme and variations » to be used all along a film. The melody was dedicated to somebody, indeed. Still around. Alas this one wasn’t choose. So I had the theme and 10 variations, 11 tracks total to recycle. For this junto I decided to gather in one track four remixes of the unreleased variations, to make a sort of suite around this sensitive Em theme. 3- Piano, guitar, upright basses (pizz), bass clarinet, horn. 4- Piano, guitar, upright bass (pizz),accordion, melodica. @DeDe This is beautiful. It’s making me imagine Ennio Morricone and Evan Lurie composing after a long trip around South America together. On a less romantic note, I’m now panicking about what to submit! !